The RimRock™ Scroll Cross Pendant w/ Purple Turquoise features a 10 mm gemstone with a border of translucent crystals. 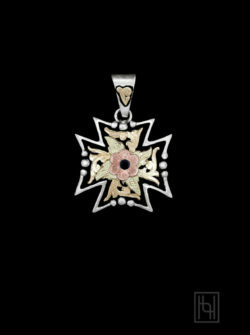 The straight armed cross has yellow gold fill scroll work throughout the center and detailed sterling silver edges and contrasted by a black antique background. Sterling Silver and 1/10th 10k Yellow Gold with a Square 10 mm Genuine Purple Turquoise* Cabochon in a Bezel Setting, Crystal Clear Cubic Zirconia, and Black Antique.